Beyond Divinity is Larian Studios’ new role playing game set in the award-winning Divinity universe. In Beyond Divinity, you become soul-forged with a Death Knight. Your fate is to spend the rest of eternity bonded to this creature of evil, unless you can undo this curse. You and your unlikely companion embark on a great adventure to unlock the secret of riftrunning... your only answer to this life of darkness! 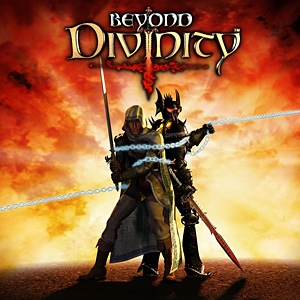 Beyond Divinity has been released in April 2004. Read the full press release here Beyond Divinity is Larian Studios’ new role playing game set in the award-winning Divinity universe. In Beyond Divinity, you become soul-forged with a Death Knight. Your fate is to spend the rest of eternity bonded to this creature of evil, unless you can undo this curse. You and your unlikely companion embark on a great adventure to unlock the secret of riftrunning... your only answer to this life of darkness! Beyond Divinity has been released in April 2004. Outstanding Achievement in Music - IGN RPGVault Beyond Divinity has been awarded with the "Outstanding Achievement in Music" award in 2004 for the music. Kirill Pokrovsky demonstrated his talent and sensitivity by creating a score for Beyond Divinity that may well be its defining strength. The individual tracks not only succeed in capturing and conveying a variety of moods to suit the game's range of situations, but also come together to form a unified and eminently enjoyable whole that played a critically important role in Larian's intriguing tale of a character soul forged to a Death Knight." Please discover a few Beyond Divinity tracks in the MP3 download section at the right. There will be added some more later on.